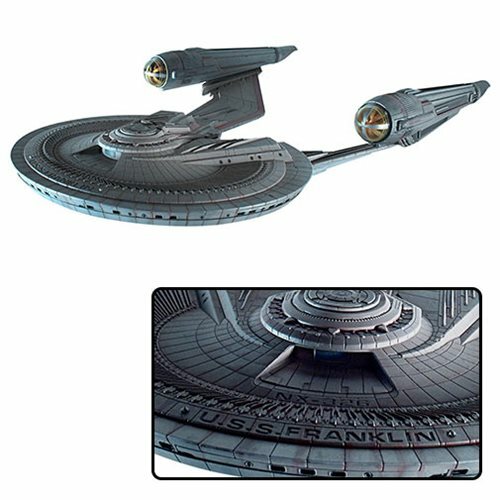 Moebius Models introduces the U.S.S. Franklin from the hit film Star Trek Beyond. Measuring over 15-inches long and nearly 9-inches wide, this precision-tooled styrene kit features screen-accurate detailing, based on actual digital visual effects files. This skill-level 3 kit includes clear bussard domes and clear windows, as well as a Starfleet insignia display base. The Star Trek Beyond U.S.S. Franklin 1:350 Scale Model Kit also includes worn and new decals, along with a full-color instruction booklet. Complete with box art by legendary Star Trek production illustrator John Eaves, this kit includes 95 parts and requires paint and cement (sold separately).